The collision was reported in the area of Franklin Street and Geary Boulevard. A pedestrian was fatally struck by a bus in San Francisco Thursday morning, according to police. The collision at Franklin Street and Geary Boulevard was reported at 10:48 a.m. Police said a woman exited a paratransit bus and began to cross the street when she was hit. "At some point the driver of the vehicle accelerated and a collision occurred between the passenger and vehicle," said Giselle Talkoff with the San Francisco Police Department. The bus stopped across the intersection. Police said it is unclear who had the right of way. The victim used a walker. Her eyeglasses and a hat lay in the street following the collision. Daisy Brooks was attending a meeting for seniors at the time of the accident. The 77 year old has fliers on upcoming town hall meetings about pedestrian safety for seniors and people with disabilities. "My concern right now because I have osteoperosis and because I can't look up and down, sideways," Brooks said. Police said the driver involved in the accident is cooperating with the investigation. An SFMTA spokesperson said it regulates the contractor and the driver is a veteran paratransit operator who previously worked with the provider. It was also the driver's first day back. San Francisco has 13,500 registered paratransit riders, with 80,000 trips each year. 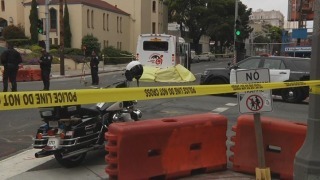 San Francisco police and fire are responding to a fatal collision involving a pedestrian near St. Mary's Cathedral. Thursday, according to SFPD Officer Wilson Ng. A bus collided with a pedestrian in the area. Some lanes may be closed and drivers are asked to avoid the area if possible. Buses are being rerouted around the area. The San Francisco medical examiner's office has responded to the scene.